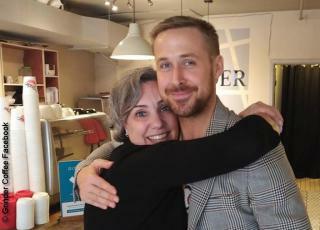 When Ryan Gosling dropped into a coffee shop in the east end of Toronto, it was the result of an internet campaign by Grinder Coffee. Last year, they campaigned to get actor Idris Elba to visit, to no avail. This year, they set their sights on Canadian Ryan Gosling -- and it worked. Ryan is in town to promote his movie First Man at the Toronto International Film Festival. In it he plays astronaut Neil Armstrong, the first American to walk on the moon. Grinder Coffee has been posting for nine days in an effort to get Ryan to stop in and on Tuesday, store owner Joelle Murray posted a photo of Ryan hugging her, with the caption: "And this happened... it worked. Our #ryanneedsgrinder campaign actually worked. The man himself Ryan Gosling showed up at Grinder and had a coffee with us. What a good sport (you can only imagine what Joelle actually said) thanks for everyones support. A big thanks to Ryan for taking the time out of #tiff to visit Leslieville. What a gracious well brought up Canadian boy. Take that Idris Elba your loss!!!!" She found out from Ryan that it was his mother, who was his date to the First Man premiere on Monday, who noticed the campaign and talked her son into the visit. Murray said, “She has free coffee for life at Grinder whenever she wants." © 2019 Tribute Entertainment Media Group. Toronto International Film Festival is a registered trademark of Toronto International Film Festival Inc.